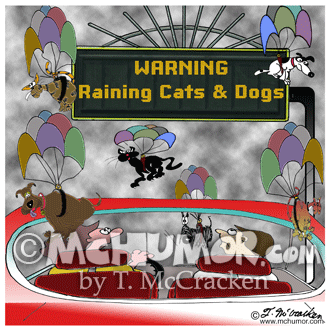 Dog Cartoon 7882: A road sign says, "Warning, It's raining cats and dogs." Cats and dogs with open parachutes falling out of the sky. 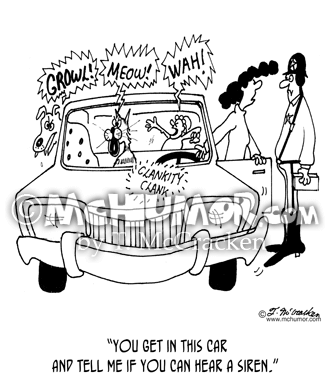 Mother Cartoon 4180: As a baby screams, a dog barks and a cat meows inside her car, a woman says to a highway patrolmen, "You get in this car and tell me if you can hear a siren." 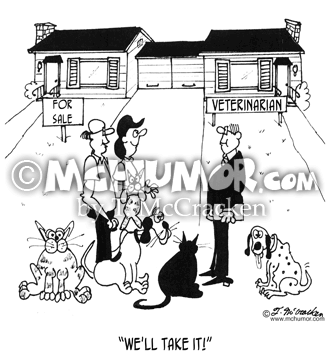 Veterinarian Cartoon 4149: A couple with lots of cats and dogs looking at a house right next door to a veterinarian saying, "We'll take it!" 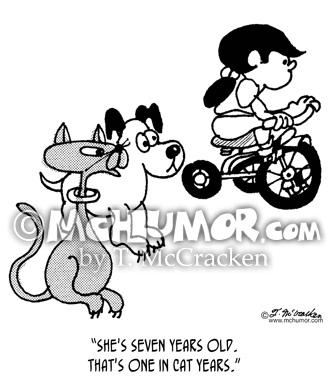 Pet Cartoon 3054: Cat looking at a little girl saying, "She's seven years old. 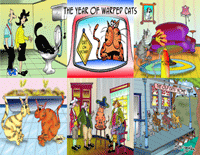 That's one in cat years." 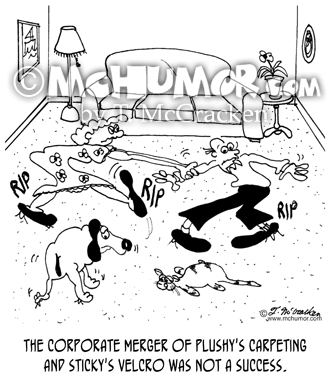 Carpet Cartoon 6412: "The corporate merger of Plushy's Carpeting and Sticky's Velcro was not a success." 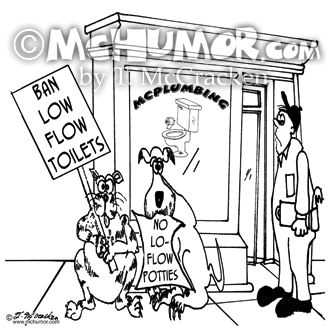 People, dogs and cats are stuck walking across rugs. 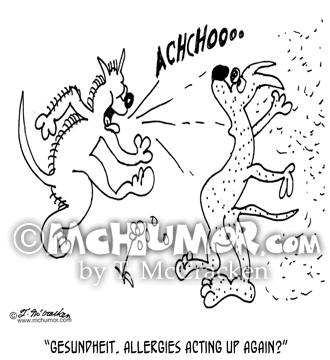 Dog Cartoon 7612: A dog sneezes and blows off all the fur off another dog in a park that says, "Gesundheit. Allergies acting up again?" 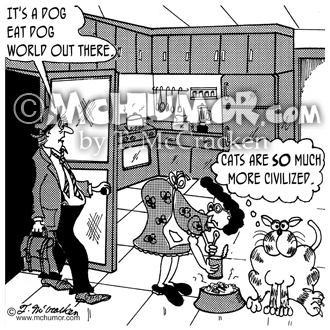 Dog Cartoon 6829: A cat hearing a man say, "It's a dog eat dog world out there," thinks, "Cats are SO much more civilized." 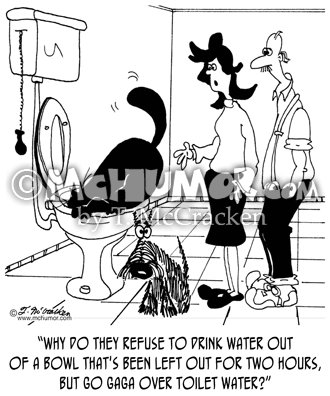 Pet Cartoon 0009: As a cat and dog drink from a toilet a woman says, "Why do they refuse to drink water out of a bowl that's been left out for two hours, but go gaga over toilet water?" 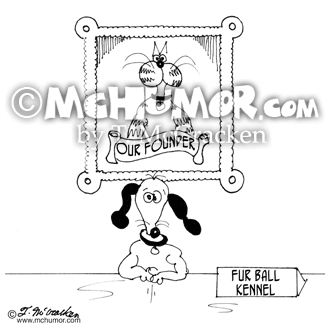 Dog Cartoon 6793: A kennel run by a dog has a portrait of " Our Founder." It's a picture of a cat. 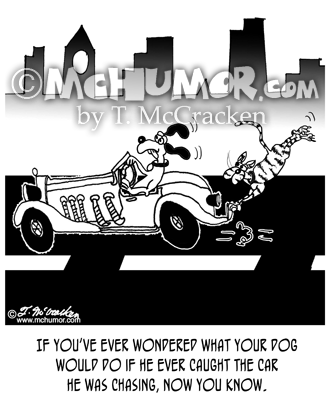 Dog Cartoon 8353: "If you've ever wondered what your dog would do if he ever caught the car he was chasing, now you know." A dog drives a roadster while a cat hangs on to the bumper. 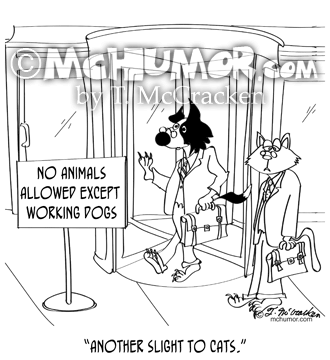 Pet Cartoon 6470: A dog has a small space ship in its mouth, and a cat has a small alien in its mouth. 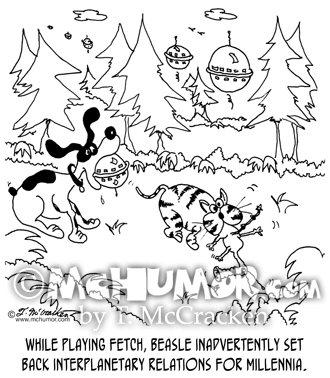 "While playing fetch, Beasle inadvertently set back interplanetary relations for millennia." 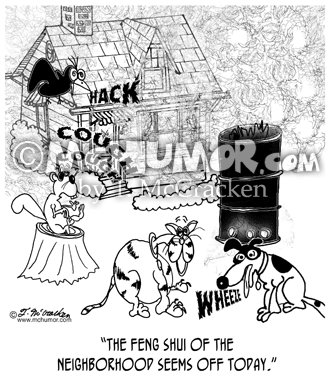 Pollution Cartoon 8394: A cat, dog, squirrel and bird are coughing and hacking next to a burn barrel. "The Feng Shui of the neighborhood seems off today."